But then one of the tour leaders said he bought 10 packages of the rugelach from the bakery. He took a couple of the plastic packages out to share with the rest of us. Until I saw what was in the package. 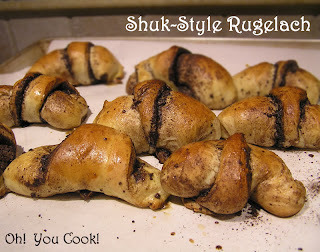 These rugelach clearly didn't look anything like the kind made or sold in these here United States. 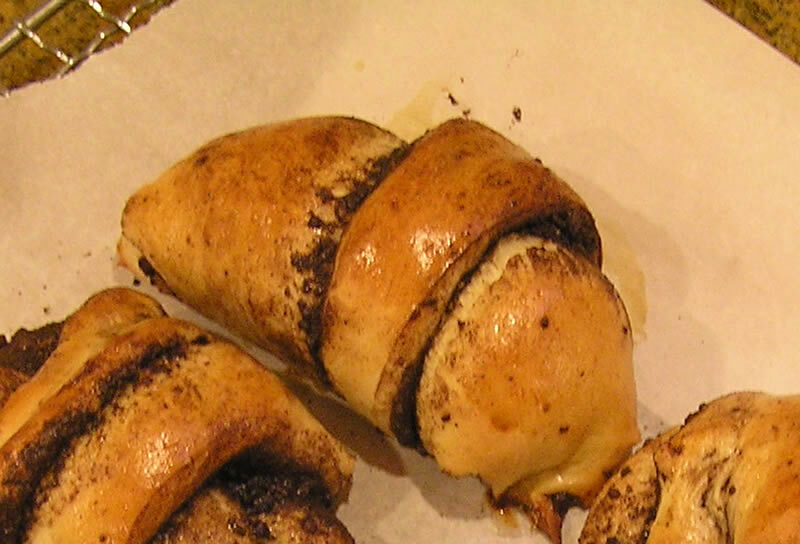 U.S.-style rugelach are small, made with dense cream cheese dough and coated with crushed walnuts. 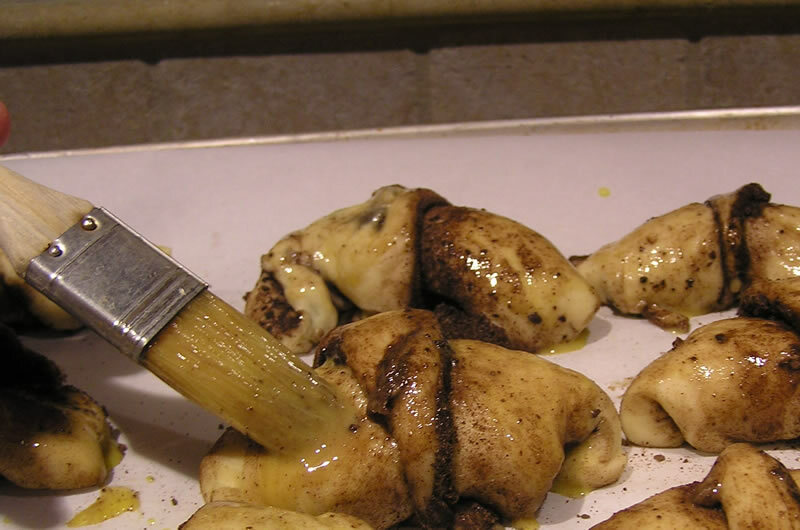 Shuk-style are longer, flatter, shiny and look like they ooze greasy cheap chocolate. They did not look at all appetizing. When the box came to me I politely passed it along to the next row. The next day on the bus, the tour leader "complained" that he still had lots of rugelach left and passed out a few more packages. This time I was starving, and when you're starving anything looks good, so I took one and hesitantly took a nibble. 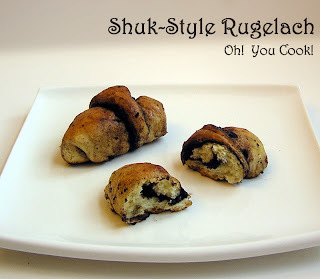 Dear Reader, this rugelach was the best I ever nibbled. It did not taste at all greasy. It was quality chocolate heaven rolled up in a flaky pillow. It literally melted in my mouth. I wound up eating 3 pieces, stopping only to be polite. Then promised myself to attempt a clone upon our return home. The dough resembled a cross between challah and brioche, which makes kinda sense since challah plus tons of butter equals brioche. So I took half of my challah recipe and tweaked it a tad. I used margarine because I believe the shuk version is made with coconut oil to be parve (non-dairy) and I didn't have coconut oil. The result was very good. 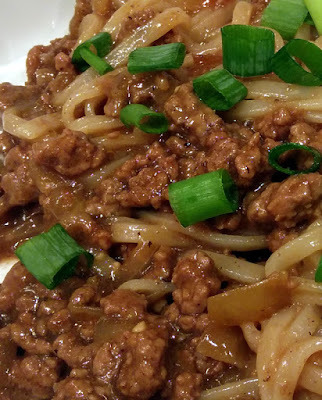 Not yet shuk-style, but something that could be served to company without embarrassment. Next time I will roll the dough out more thinly. The recipe below reflects this change. Separate one of the eggs into two small bowls or cups; set the bowl with the yolk aside to use later as glaze. Lightly beat remaining egg with the extra white; set aside. Oil a large bowl with 1 teaspoon of the oil. Line a large rimmed cookie sheet with parchment paper. Set everything aside. 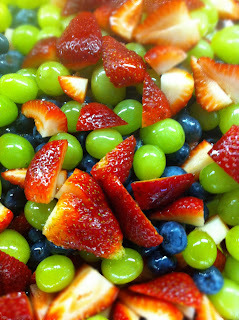 In a large mixing bowl, whisk together 1 1/2 cups of the flour, yeast, 1/3 cup sugar and salt. Add margarine or coconut oil and the warm water. 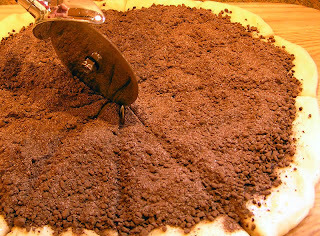 Using the dough hook attachment of the mixer, set on low (or #2 if using kitchenAid mixer) and combine ingredients well. Pour beaten egg onto dough and continue to mix on #2 speed until incorporated. Add remaining flour, a quarter cup at a time to dough until dough is no longer sticking to sides of bowl. This should take about 2 minutes. Continue to run mixer at low or #2 speed for an additional 8 minutes. 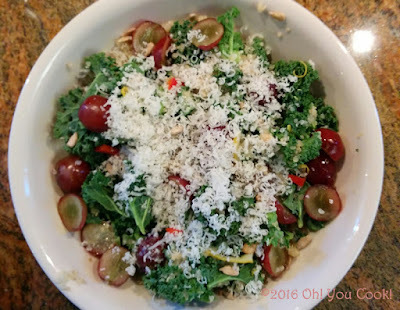 Place dough in oiled bowl, turning dough to coat. Cover with a clean towel and let rest in warm place for 15 minutes. Overprocessed. You want bits larger than micro-sized. Meanwhile, make filling: pulse chocolate in a food processor. You want small crumbs; avoid overprocessing the chocolate into powder. Add the 1/4 cup sugar, cocoa powder and cinnamon and pulse a few time to combine. Back to the dough: punch dough down with fist to deflate, then remove half of dough from bowl (cover remaining dough). 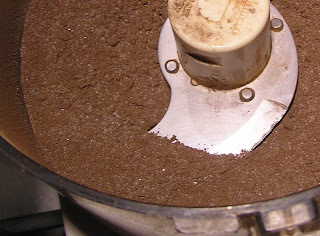 Roll out into a circle about 12 inches in diameter on floured surface. Brush circle with 1/2 tablespoon of oil, about 1/2 inch in from edge. Cover oil with half of the chocolate mixture. Cut circle into 12 triangle wedges. Starting with edge opposite the narrow point, roll each triangle up to the point. Press point in gently to seal. 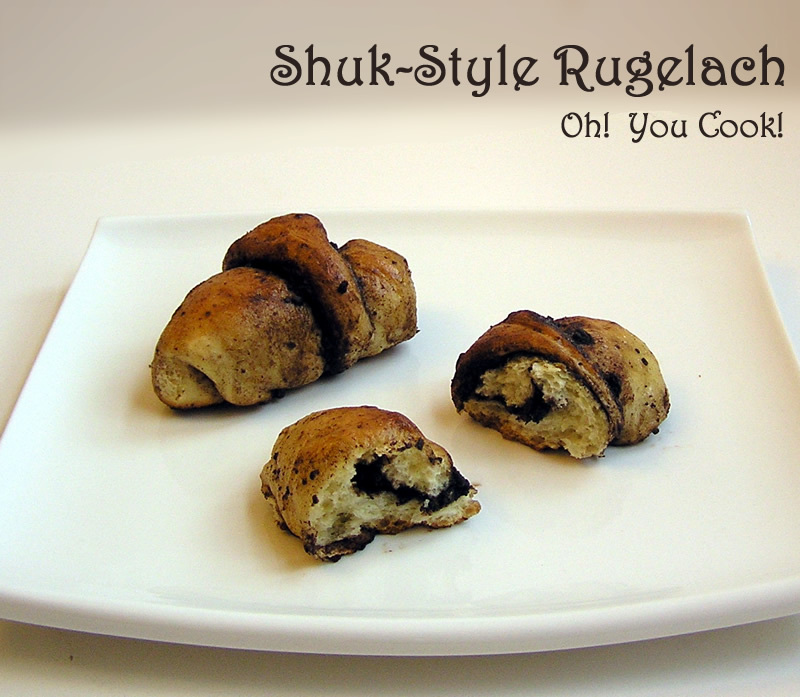 Try to make rugelach a little more even-sized. Place on prepared cookie sheet, pointed end on bottom. Gently turn corners in ever so slightly to make a crescent. Repeat with remaining dough. 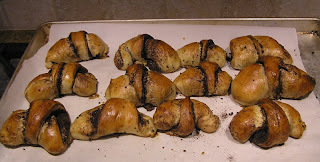 Cover rugelach loosely with towel and let rise in warm place 20 minutes. Preheat oven to 350F. Add tablespoon cool water to remaining egg yolk and gently whisk to combine. With pastry brush, cover rugelach with egg-water mixture. Place rugelach in oven; bake for about 20 minutes, or until golden brown. 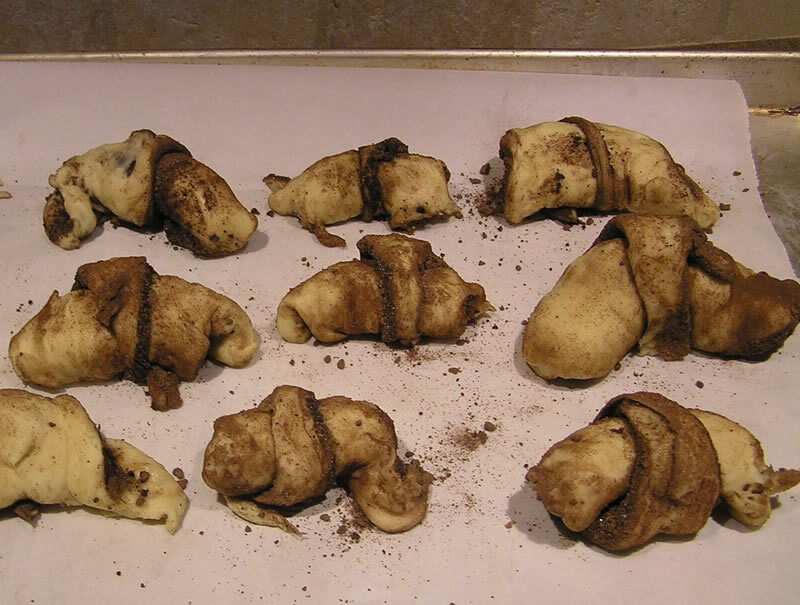 Immediately transfer parchment with rugelach onto cooling rack. Cool completely before serving. Store leftovers covered at room temperature up to a few days. Why wouldn't you just say Marzipan? Didn't want to advertise it.